We’ve heard that even the best of witches deserve a little me time after a busy day so, the Bewitched Bubble Bar from Lush is the perfect way to wind down. At only £4.95, the feline inspired bar can be crumbled under warm water to get rid of superstitions and dark moods. If your little one is looking for the perfect pumpkin outfit, we recommend H&M’s Fancy Dress Costume for £14.99. All that’s left to do is have fun with bright orange face paint and enjoy! 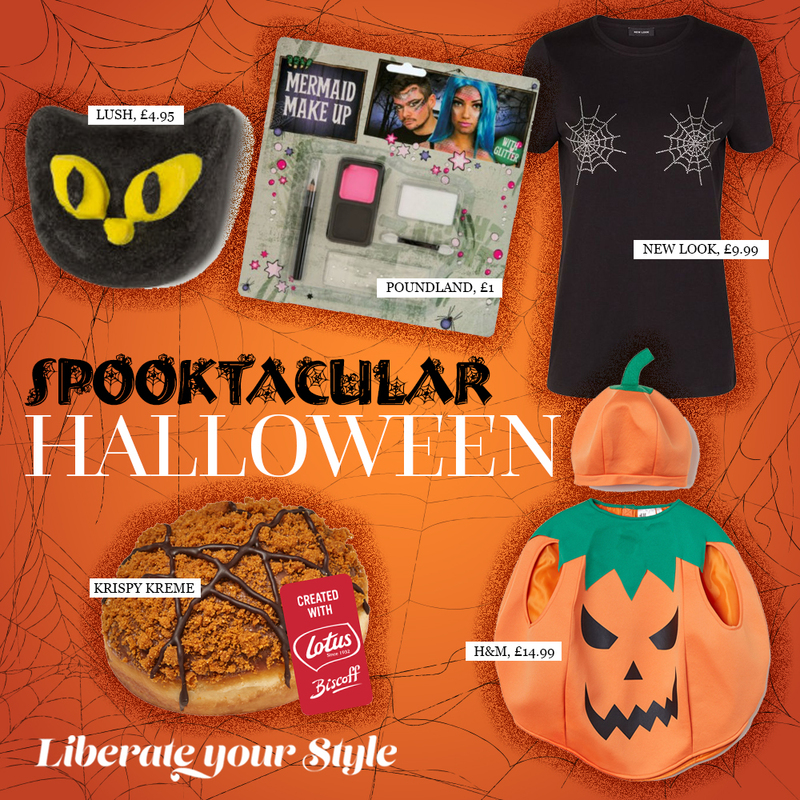 Be the spookiest at the party with New Look’s Black Gem Spider Web T-Shirt for £9.99. Pair with leather trousers and ankle boots for added attitude that’ll really make heads turn. Krispy Kreme’s S’Mores Doughnut is lovingly created with Lotus Biscoff and filled with marshmallow and chocolate and then dipped in rich chocolate and covered with a Lotus Biscoff crumb. A great treat for cold nights, this is sure to be the favourite for your trick or treaters. Head to Pairs in The Liberty to ensure you’re looking super & spooky this Halloween. With everything from full costumes to masks and FX transfers, Pairs is the place to pick up the latest costume trends. If you’re really looking to transform into a mini monster this Halloween, why not head to Poundland for a range of face paints. We love the Mermaid Make Up Kit! (£1). For more inspiration and ideas, from fashion to home, don’t forget to follow us on Facebook, Twitter, or Instagram. For information on our Halloween Half Term activity, visit the events page on our website.